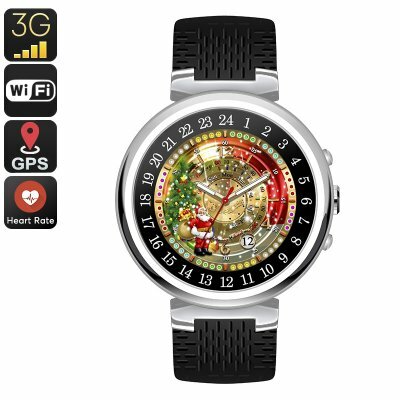 Successfully Added IQI I6 Smart Watch Phone - Android OS, 1 IMEI, Bluetooth, WiFi, 3G, GPS, Pedometer, 2MP Camera (Silver) to your Shopping Cart. Take your connectivity to the next level with the IQI I6 smart watch phone. This futuristic phone watch features an Android operating system and supports 1 IMEI number – making it so much more than a regular smart watch. Simply slide in your SIM card and you’ll be able to enjoy all regular Android smartphone features straight from your wrist. Whether you wish to make calls, send messages, browse the web, or check social media – the IQI I6 smart watch phone supports it all. Thanks to its stylish and high-end design, this beautiful gizmo can be worn with confidence at any given occasion. Within its sleek body, this Android smart watch packs some sophisticated hardware. A Quad-Core processor is in place along with 2GB of RAM. Together, this hardware lets you enjoy all the basic Android features and Applications out there. You’ll have access to the Play Store, meaning that you can always download the latest mobile entertainment of your liking. With WiFi and 3G support, you can even browse the web no matter where you’re at. With the IQI I6 smart watch phone at your wrist, you’ll always stay within reach to friends and family. On its crisp 1.3-Inch display, this phone watch treats you to clear visuals at any time of the day. You’ll furthermore be treated to a 400mAh battery that supports days’ worth of standby time and several hours’ worth of continuous usage time. With GPS support you can be assured that you’ll never get lost again and a built-in 2MP camera lets you shoot stunning pictures and HD video on the go. The watch phone even supports Bluetooth connectivity. This allows you to pair it with your smartphone and use it along with all its features without needing to insert a SIM. The IQI I6 smart watch phone comes with a 12 months warranty, brought to you by the leader in electronic devices as well as wholesale Bluetooth watches..